If you like a waterfront view, how about a view of the water from every room in your home? 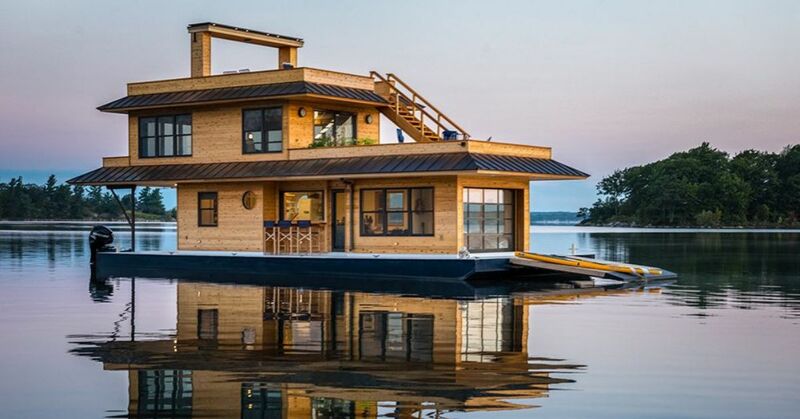 It's possible on this barge yacht. Designed by Rich Rossmassler and built by Tim Purcell, it's like a luxury loft space with its own beach club. It features two indoor living spaces and two rooftop decks with plenty of outdoor seating areas to enjoy the view of the St. Lawrence River. Built with the purpose of living off the grid, the yacht uses solar and wind power to avoid having a generator. A rooftop garden flourishes on one of the decks, fed by recycled water from the yacht. As the owners like to say, "The future is floating." If the future promises a chance to live aboard a barge yacht such as this one, then the future is buoyant indeed. The kitchen and living room are on the lower level. 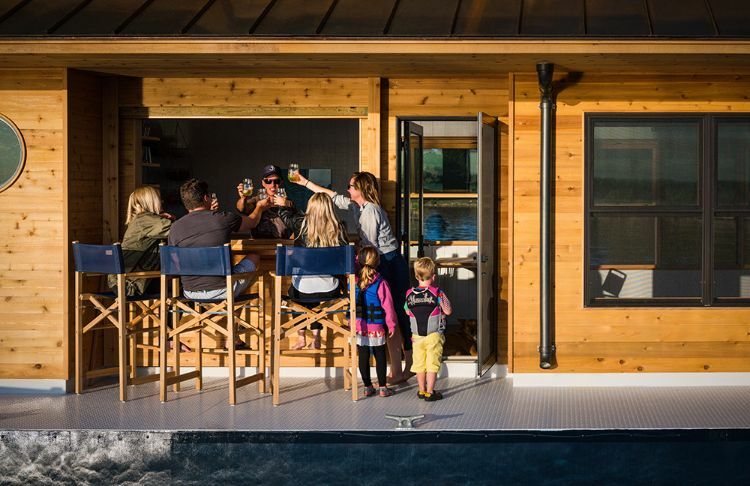 There's room to store anything you might need for a pleasurable day on the river, whether it's scuba gear or a guitar for a little music after dinner. In the living room, even the retractable garage door is made of windows to maximize the view when it's closed. The floors are made of white oak designed in a diagonal style for extra interest. The comfortable cushions were provided by Irish and Company. Della the dog definitely recommends this spot for an afternoon nap. The kitchen provides plenty of prep space as well as storage for whatever you need for a summer cookout. Note the cedar planks on the ceiling that add another stylish detail to the room. The kitchen also boasts this amazing retro SMEG custom refrigerator. The pale blue color reflects the shades of blue on the cabinetry, and together they are a reminder that you are surrounded by blue sky and clear water. 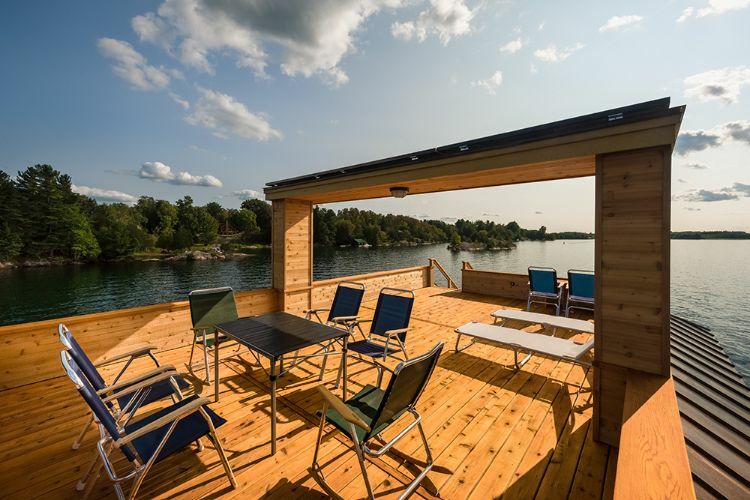 This is an ideal spot to host family and friends while touring the St. Lawrence River. No matter what the occasion, there's always a good reason to gather at the barge bar. The owners call this area "beach by day, dining deck by night." This hydraulic ramp can function as a swimming platform, boat ramp and ultimately an evening dining deck where they relax and enjoy the sunset after a day of water sports. It's time to head upstairs to explore the sleeping area of the barge yacht, and this is a good chance to enjoy the view from the two rooftop decks. The master bedroom is the picture of serenity. Surrounded by views of the water and nearby forest, sweet dreams are guarantees. Can you imagine waking up to this view? There's no reason to get out of bed, unless you're tempted to have your morning coffee on the seating area just outside the master bedroom. The mid-level deck is an ideal spot for a rooftop garden. The plants will enjoy the sunshine as much as you do. Who can resist this outdoor shower, and why would you? The advantage of living on a barge yacht is that you don't have next-door neighbors to worry about. The copper roof overhang is visible once you've reached the upper deck. This relaxing spot sets the stage for playing your guitar for friends as you watch the sun set. Occasionally a storm will roll by, but there's no reason to worry. The barge yacht can be sealed and secured, and you're free to enjoy the wonder of nature. In fact, experiencing the beauty of fog and rain may create some of your favorite memories on this floating oasis. After all, when the rainbow appears over the river after a storm, you've got a front row view.